If you are like me, a structured class can be hard to fit into your weekly schedule. Whether its long hours on the job, crazy deadlines or family responsibilities, having to meet at a specific place and time can for a number of weeks is a big chunk of your precious free time. How did we ever do it in college?? Online courses are a great way to continue learning … on your schedule not the professor’s. BetterPhoto.com has been around for a number of years. Every year they continue to grow the variety of online classes: available in either 4-week or 8-week sessions and skill levels of Beginner, Intermediate and Advanced. Each class is taught by a professional in the field and is structured just like any other class. Lessons are delivered by email and there are weekly assignments. Your homework is them submitted and discussed by the virtual class in a closed forum (limited to the class enrollees and the instructor). Your classmates are usually just as helpful as the instructor, but much quicker to respond 😉 The instructor provides a private critique of your assigments, so there is no fear of public humiliation. You are encouraged to try something new and supported in the endevour. I have taken a few of their classes and really enjoyed them. My favorite instructor was Kerry Drager. Kerry has written several books and is a columnist in Shutterbug Magazine. He is a wonderful teacher with infinite patience! 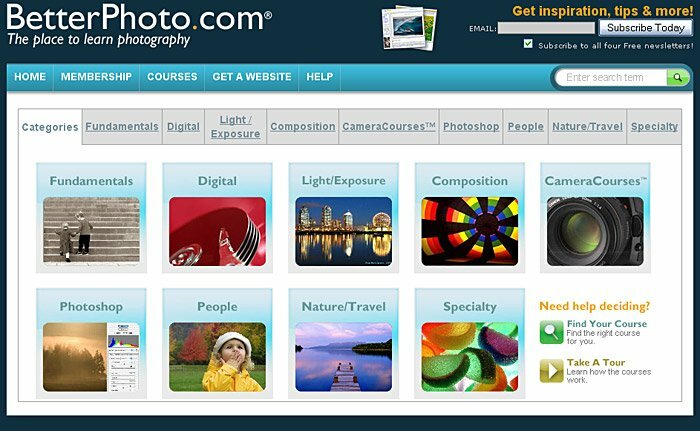 BetterPhoto.com also has monthly contests in a variety of themes. But, be warned, these competition is tough! The calibur of photographers makes even placing a challenge. Of course, there are also the WTF placers, but the winners are usually well-deserved. So, instead of working on your suntan this Summer, try an online class at BetterPhoto.com.